Happy Friday Everyone! I made it through my first week back at work, just one more week to go and then it's back to summer vacation for me. That means no more setting alarm clocks and lots of time to paint my nails. Until school starts up again in September that is. 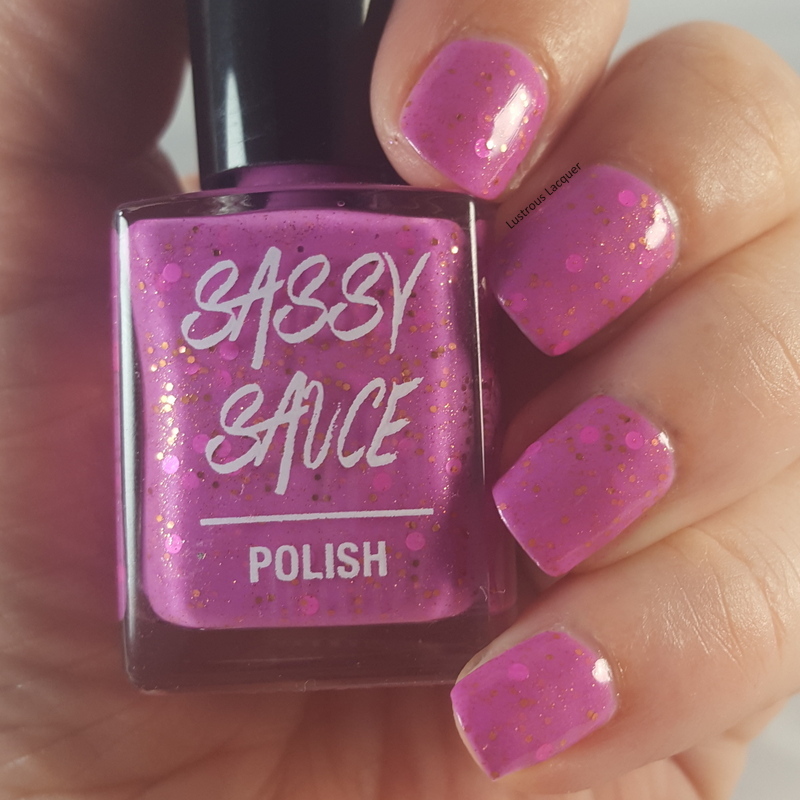 Speaking of painting my nails, I was recently given the opportunity to paint them with a brand new indie: Sassy Sauce. And when I say brand new I mean brand new, you can't even buy her polishes yet, but you will be able to tomorrow. 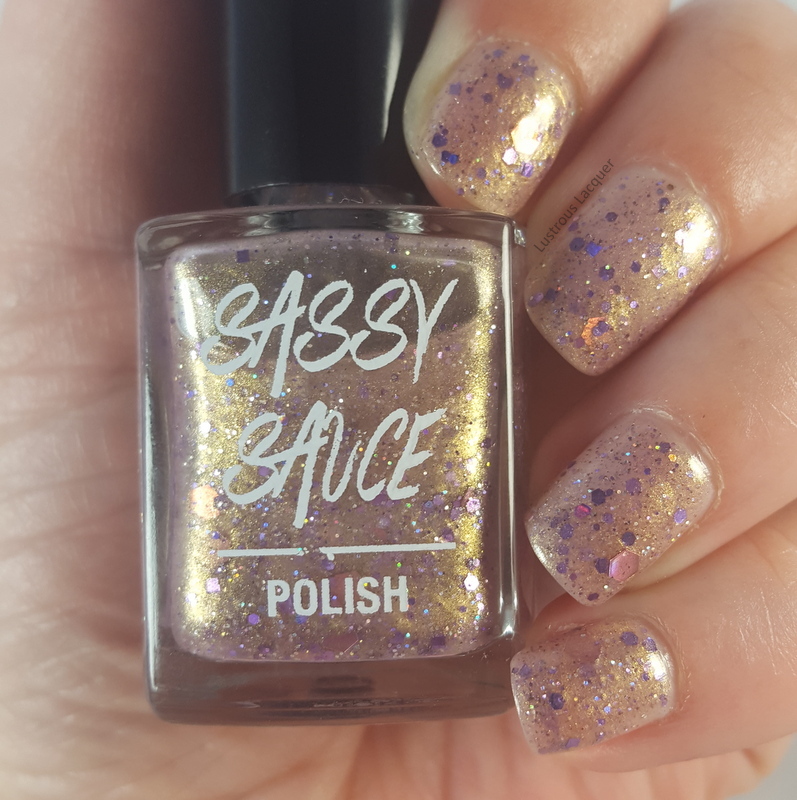 That's right the very first bottle of Sassy Sauce Polish will be sold at 11 am CST on July 15th. How exciting is that! 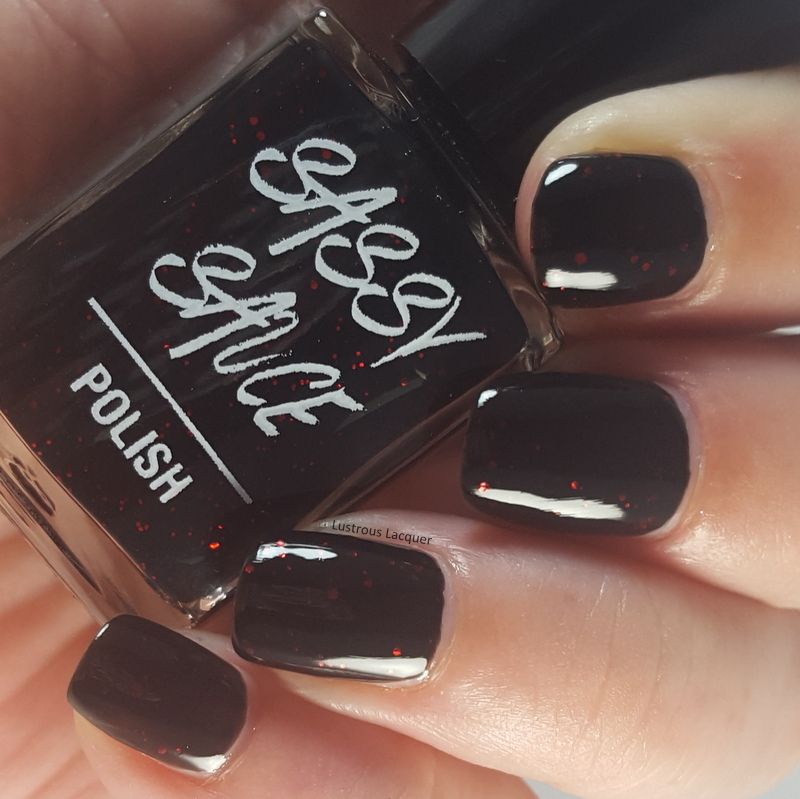 Today I will be sharing 5 polishes from the inaugural launch with you but there are more to come. 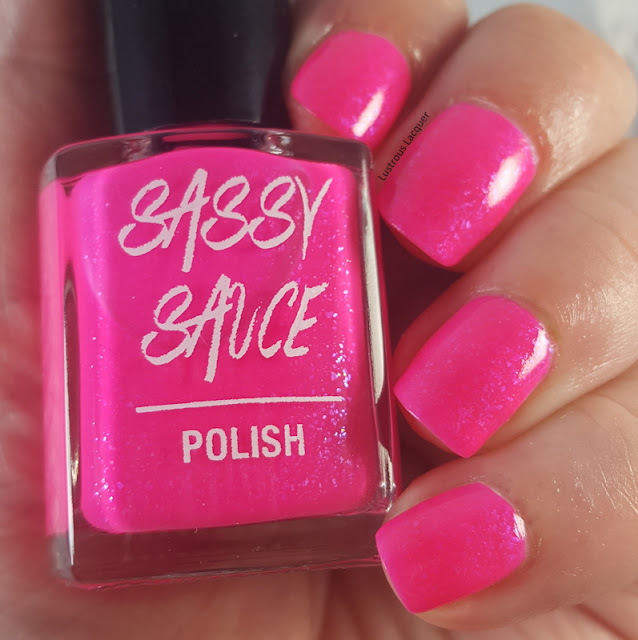 For today all polishes will be shown as 2 coats plus a layer of Sassy Sauce's personal top coat and photographed in my light box using daylight light bulbs. 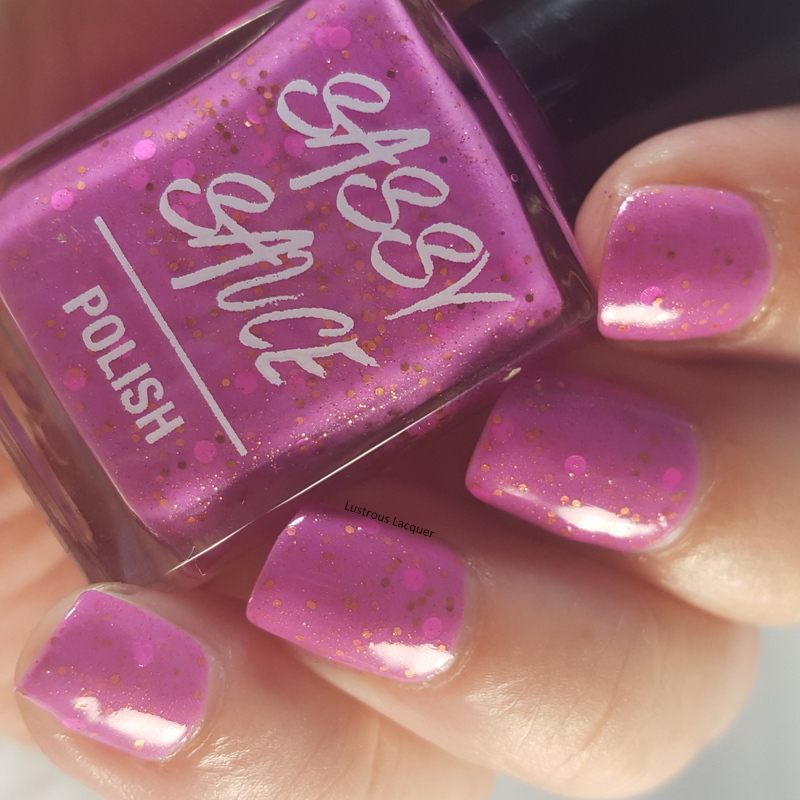 Color: A coral colored base with gold and purple shift and purple holographic glitters. In most lighting, the base took on a rose gold hue. Application: I had a smooth application with even coverage and tons of the smaller glitters with each coat. 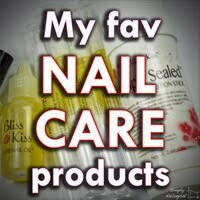 I did need to do a little fishing for the larger glitters due to some settling in the bottle but nothing more than swirling my brush around inside the bottle to get them. Finish: Dried with a slight texture due to all the glitter but not anything close to what I would consider a chunky texture. And all the glitters laid completely flat on the nail. Color: A bright pinkish purple crelly base with Bright pink and copper glitters in various sizes. Application: Smooth even coverage with tons of glitter in each coat. 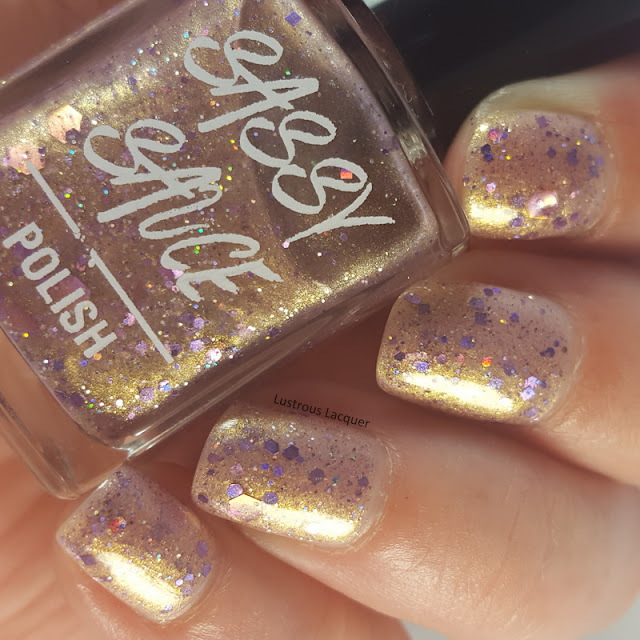 There was no fishing for glitter required with this one and all the glitter laid flat against the nail. Finish: Dried to a smooth finish. Color: Medium neon pink with tiny blue glass flecks. 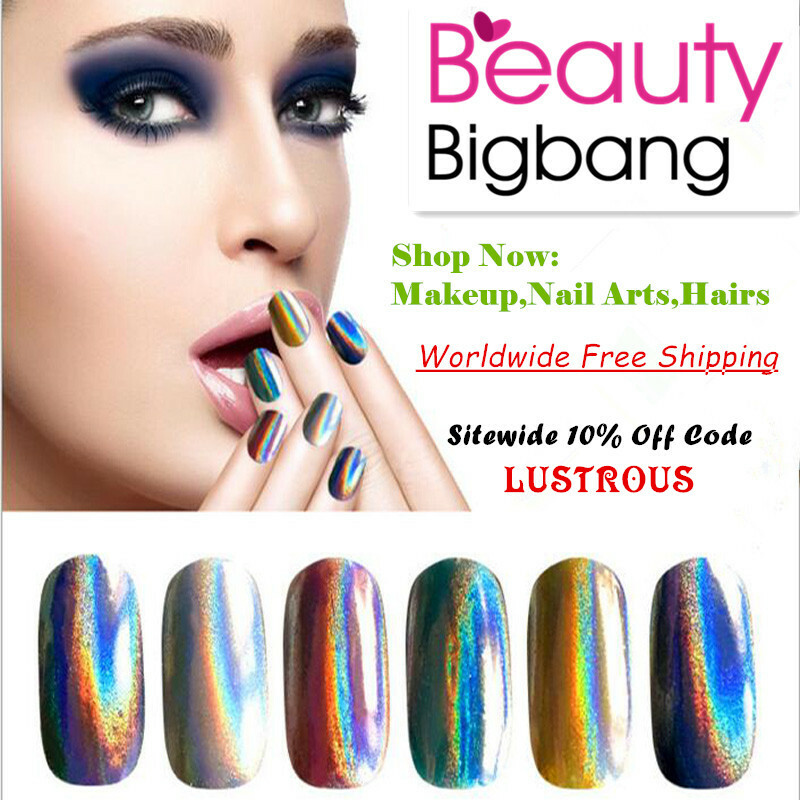 Application: Effortless application and extremely opaque on the first coat. Heavy coverage with the glass flecks for each coat. Finish: Dries to a smooth glass like finish. 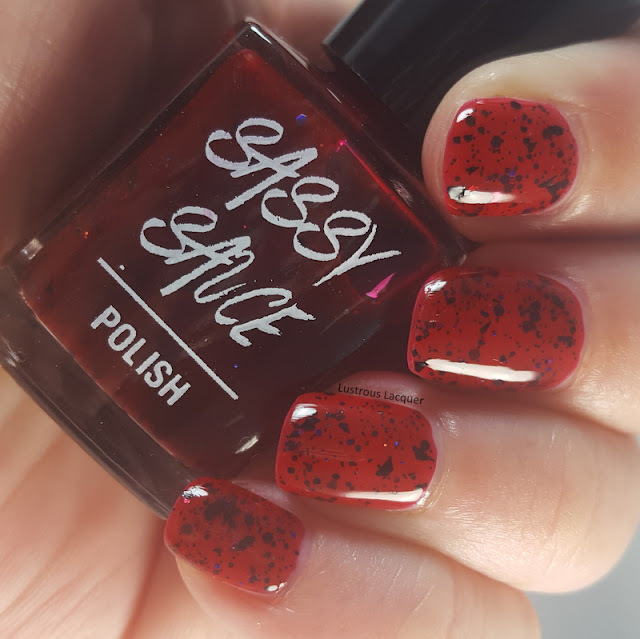 Color: Red jelly base jam packed with black and holographic glitters. Application: Amazing coverage and very opaque coverage for a jelly. 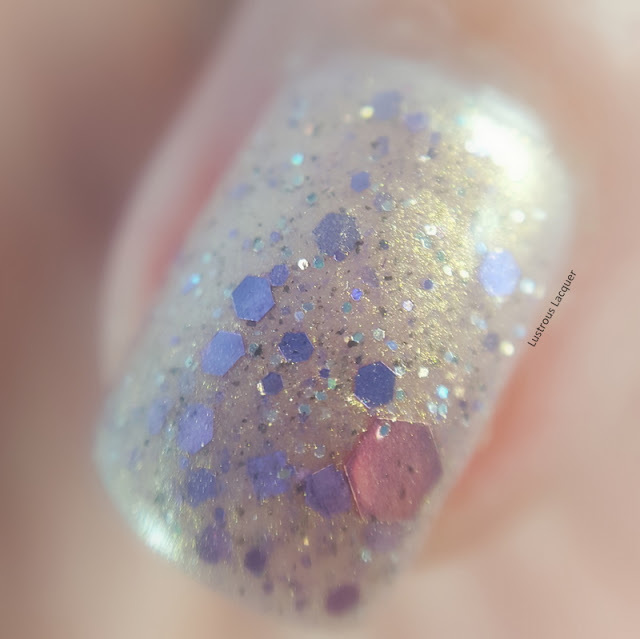 Amazing glitter coverage in each coat and no VNL after 2. 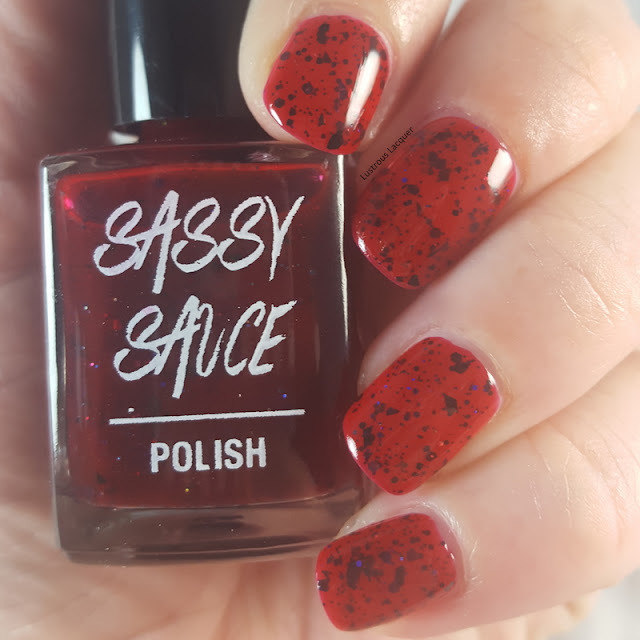 You don't get that often with a jelly polish! Finish: Dries to a smooth glossy glass like finish. Color: Black jelly based polish with a smattering of red glitters. Application: Smooth flowing formula with very even coverage and amazing opacity. I did have a slight VNL after 2 coats but I had to really look for it. 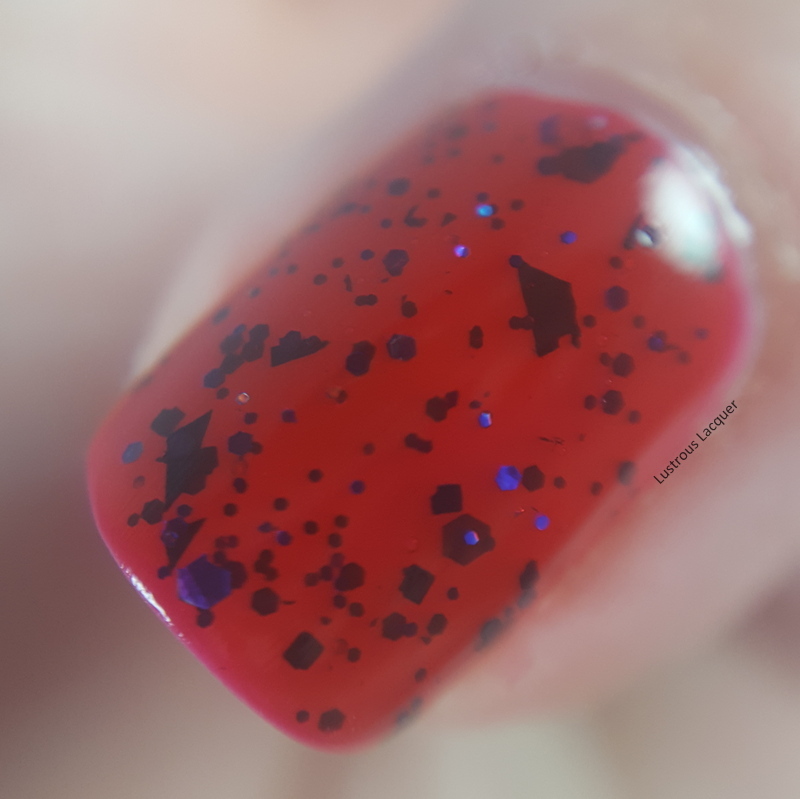 Sadly because the base color is so opaque you do lose a lot of the red glitters. 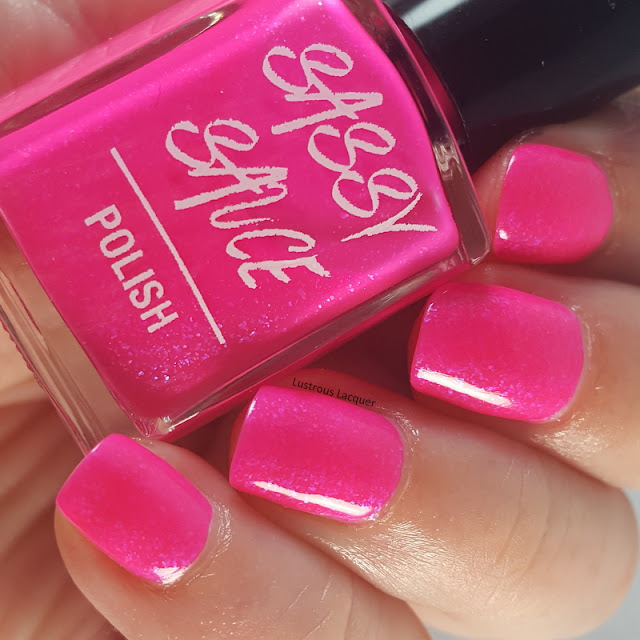 Now at the beginning of this post, I mentioned using Sassy Sauce top coat for all my swatches. At the time of writing this post, that top coat has no official name but I believe it was being called Sassy Top Sauce. Well weather it has an officialy name or not I was really impressed with it. Not only did it dry quickly for me but it was extremely glossy and smoothed out the texture of Giltzie Pleasure with 1 coat. I was sent a sample sized bottle to test out and will be picking up a full sized bottle when the shop officially opens. 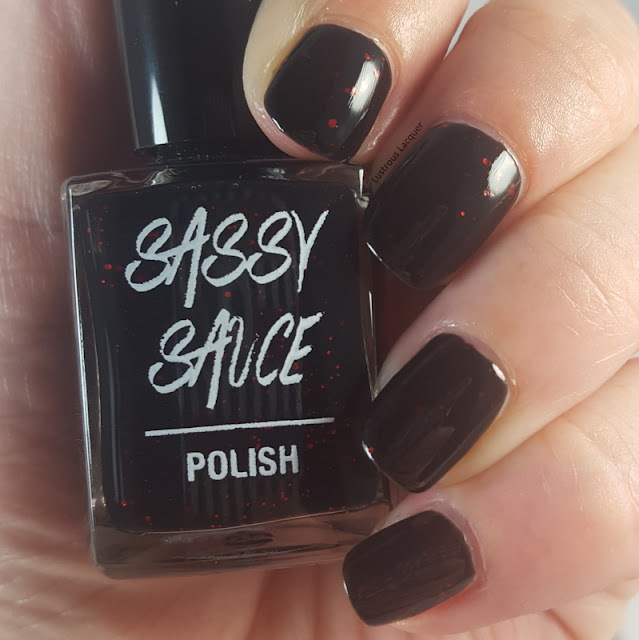 Out of the 5 polishes I've shared with you today Dorothy's Dark Side is my hands down absolute favorite. Which surprised me because I wasn't so sure what I thought about it when looking at the bottle. 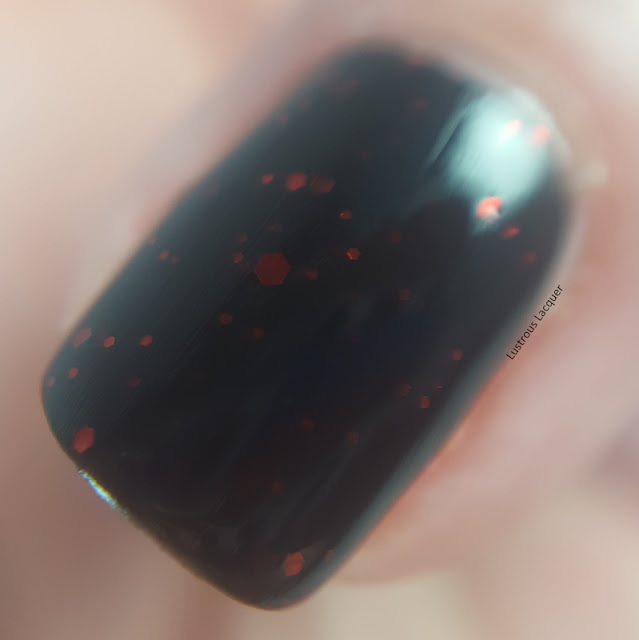 I'm a tad disappointed with Bitter Break Up because you lose so much of the red glitter in that black base. I was impressed with the formulas on all the different finishes and can't wait to watch the rest of the colors to share with you. Out of these 5 which one is your favorite? Sassy Sauce Polish will officially open for business at 11 am CST on July 15th and polishes will be $8.50 for a full sized bottle. Thanks for stopping by and Happy Polishing!